Well Roads, it's really a nice story, but i did decide not to use it as a brothel. Since Simutrans is mixing buildings all the way through, it could happen that this one appears right next to the Schoolbuilding. You wouldn't want your kids to go to school right next to such an establishment, would you? And some courthouse attractions for them to have somewhere to work, I'd say. well, as you can see, i'm quite a bit far away from drawing attractions. too, there are some more modern buildings on my list, but a courthouse wouldn't be too bad to have. Maybe some of the more experienced drawers may want to start working on this? For now, this is my current building. Please note that i forgot to change the windows on the short (non-entrance) side. This will be changed very soon. Do the frontwindows look right now, and what about the frontdoor? I thought about coloring the corners white, do you think it would fit? Yep, can't have a whorehouse next to a school house. The building is looking good! I think it is suitable for either an office building or a court house. I like the front doors a lot! Good idea on the double doors. It needs the balcony as well, IMO, it keeps the windows from being monotonous...if all the same, I think they would be. That said, the balcony needs to be wider still and the color not so dark - still needs a railing too! I like what you did with the roof. When you are finished with it, I would like to have a copy of it for my pak128 if that is okay. If not I understand. Right, the building itself is fine, nice texturing (only small commend is there seems to be an outline around one of boxes on the roof) - the problem is how "British" it looks. To my eyes it looks far more like something you might see in Europe (or the States?). Having the roof with a v shaped dip in the middle might help, making it look like a converted Victorian warehouse. Really it's your building though and we shouldn't be dictating to you details (which could often be conflicting). I usually try to work from real world prototypes of British buildings myself. I shouldn't even be posting here since I'm not playing pak128 ATM and even if I were, I would be pretty much clueless as to British architecture. So, well, I don't have a horse in this race. Sorry for the intrusion and hope you the best DB! well, since im an absolute beginner at 3d-things with almost no clue about architecture (oh, yes, a house needs walls and a roof, right?) i'm quite dependant on your help. to make things worse i'm living right in the middle of germany, and my last trip to UK has been in 2009. My only clue to british architecture is some google-maps footage. So after all, many thanks to all of you, helping me with that stuff. The front door is too "square". It resembles a bit of these modern double glass-pane doors. I'd put an arch (not sure) over it or some kind of discrete decoration over or around the door frame. After importing it into the game, i darkened the colours a bit, it's been quite bright. After all, thanks for the help so far. Next step is doing winter images for both of the buildings, if you feel like the last one is looking fine. Those Building look very good out! DB, your building is great! I'm going to copy and put it in my game. Of course I will put your name as creator...even though no one will ever see it except me. Sorry for the post Kieron but thought DB had a right to know his work is appreciated outside of Britain. There's nothing to be sorry for! Then I would like to make just one more post since I've gotten pretty interested in this building. I'm thinking it would be great as the city hall for the alpine climate especially if DB adds snow. Anyway, what do you think of the railing? Sorry I'm just like a turtle - can't turn anything loose until it thunders. If you hate it, no worries whatsoever. You want the last building from deadlyboring use as city hall? that will than be look be funny out. Funny? Explain please. It is a very substantial looking building. Not only that but the color seems like it would suit the Evergreen trees and gray landscape - also the snow - of the alpine landscape. I did some snow images for the 90's shops and offices building. the data in the dropbox has been updated, and here is some in-game picture of it. Hope you like it. Actually DB, I didn't use dropbox. I just right clicked on the image and did a "save as." Since I'll be using it in pak128 I won't need the Britain .dat file. Yep, the railing seems too massive. It draws your eye right to it. Maybe the color is too dark or it simply doesn't need to be there. At any rate the building doesn't really need it. WOW. I can not wait to see them included in pak. This one took some time since i've been quite busy with reality this week. But here it is, some Block of Flats located near Abbey Wood station. Following your suggestion i stuck to a real-world-building this time. As always, critics welcome. I like these! One very small thing - it would be good if there was a little clutter in the back yards. The Buildings on the Photo looks very good out. I can´t wait to test it. @jamespetts: Are you okay on the dropbox-version for giving you the data? I'm working on backyard clutter. @greenling: Thanks! Hopefully they will be online in my dropbox-folder tomorrow evening. @kierongreen: Well, they aren't too long in reality, as you can see by the attached picture. But i'll definetly do some color-variations aswell as i thought about giving them another floor or two, so there will be some more variation. These look great! My only criticism would be that the front doors seem a little too colourful; or at least that the colours seem a little strange for front doors. I've made up a new version with some stuff in the backyards, and a second version with different colors. Hope you like it. Sources and pakfiles as usual in dropbox. Those building looks very good out. That latest screenshot makes me think - are the squares below the flats garages? If so it might be an idea to double the size of them (and only have 4 under each block rather than 8 ). I do like the way they fit in - in that screenshot you can imagine that the school served a neighbourhood of Victorian brick terraced houses which has been demolished and replaced with a load of concrete! Well, i placed the school where it is as an alternative for a modern school building. 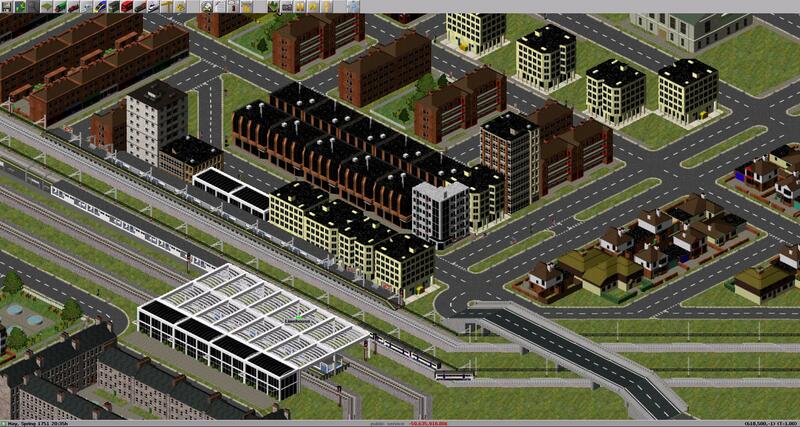 i took the screenshot from the thamesmead area of my personal greater london area. On the other hand i personally think the 8 garages quite fit the buiding. It has 4 Doors on the first floor, indicating 4 appartments on each floor, of which the building has two. Summed up it makes 8 appartments which each have a garage of their own. Quite often there isn't a garage for each flat in blocks like this, squeezing 8 under each block just doesn't fit in terms of scale (each one is barely bigger than a doorway). Thanks for your assistance, it's quite important to have someone else look at my work. 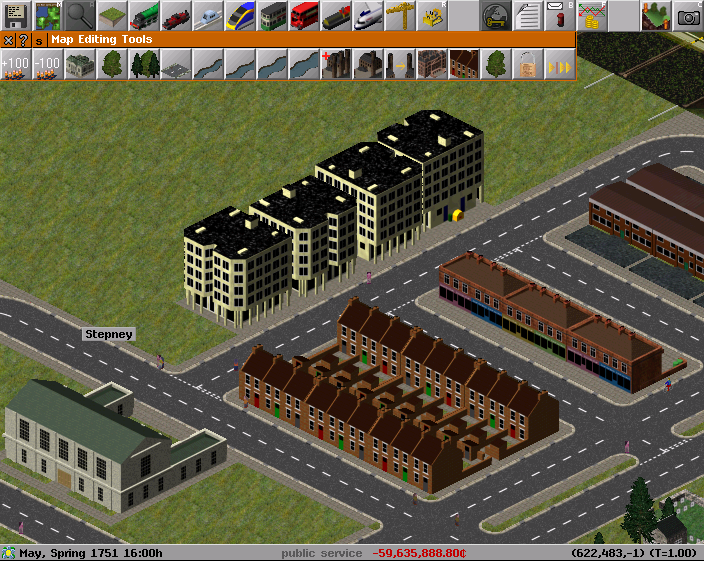 I've not had much time for Simutrans recently, but good to see some more buildings. I'd love to include all of these into the set, so if you can get round to doing snow images for the second and third ones that would be fantastic and I'll put them all in together. I'd also agree with kieron about the garages needing to be a few pixels taller. On an unrelated note, seeing the screenshot with the high-rises and parks next to each other makes me think perhaps we should code some park/open space graphics as high-level res or com buildings to get the high-rises spread out a bit. No need to apologize - it's your time and your hobby! Not wanting to pressure you but just wondering if there's any progress here? Thanks - no worries. Just didn't want you to think I'd given up on getting it incorporated into the pak either. deadlyboring, not wanting to be pushy but just wondering if you are planning on finalising these graphics soon? I'd like to put out a release by Friday and it would be great to have these in. I can always apply snow to your existing blend files if you don't have the time? Or we can wait until you get time and get them in for the next release. i think that deadlyboring get some problems to have some freetime. Awesome. I will hold the release until Friday then. That will allow for some new ships too. I've made the snow images for these and added the to SVN. Hope you don't mind, deadlyboring. Of course you are always welcome to keep drawing some more stuff if you ever get the time again! Hmm - looking for this on the Git mirror of the SVN repository I find that it hasn't been updated in 3 months. Does anyone know why the Git mirror no longer works? No - but I've now added the relevant files to standard SVN. Would you mind reminding me of the link to the SVN (assuming that the files are available on the web)? Hmm - there isn't a way on the SVN to tell which ones are new or when they were added, is there? That's one thing that was very useful about the Github mirror. What is the name of the relevant .dat and .png files for this on the SVN? Just look at the recent commits? Forgive me for being dim - where is the link for that on the SVN? Yes - Abruch is the name of the person in charge of these things, but he does not seem to respond to messages very much. Probably Aburch fixed the SVN mirror! The github mirror (pak 128 britain std) is out of date from 26/07, it may be that it is still locked? Latest commit I can see on GITHub is https://github.com/aburch/simutrans-pak128.britain/commit/4a35f1fd1c30821590e95f1b10af8e98558919d7 - 26 August 2013. This matches the latest SVN version (1297) - the pak SVN is not updated anywhere near as frequently as the code SVN. We already have an organization account at github.